Colours add to the visibility factor of a brand. An artistic appearance of a store to attract budding customers into a store is what visual merchandising is all about. Colour scheme used in a store often attracts the attention of the consumers. Just as a logo creates a recall, attractive colours attract potential clientele. Visual merchandising grabs the attention of the consumers in less than five seconds. Laying an emphasis on the sensible use of colour is an effective way to turn the customer’s attention to your store. Colours are often associated with certain emotions. For example, red is an attention grabbing colour and signifies energy, love, danger etc. It implies different emotions used in different context. When used commercially, red signifies brightness and catches the attention. Pink is associated with femininity whereas brown and green evoke a sense of nature and ecology. A retailer should have a keen understanding of these associations. To create a connection of the brand name with the colour is what a retailer should aim at. The colours of your store need to effectively attract the customer’s attention. Visibility is a primary factor behind selecting these colours. Red and yellow, being the brightest of shades, create a quick recall in a person’s mind. A retailer although, should be cautious when using bright shades like hot pink or red for his store. He can run a risk of making the store look gaudy and bright which can fail the purpose of attracting positive attention. A colour should be used in sync with its correct tone to aptly convey the retailer’s message to the consumer. Colours create a stronger recall than catchy taglines, as they create an association with your product which makes it easier for the customer to remember and relate to. The purple and red of a Café Coffee Day outlet will be visible from quite a distance away even if the name is not visible to the eye. Thus, the association which a brand creates with the colour makes its visibility in an already crowded market area much stronger. Not only do colours evoke emotions but also engage the eye and, the brighter the shade the more pleasing effect it has. The chocolate browns and fiery orange of a Barista coffee shop play a major part in attracting its clientele. 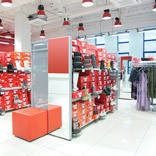 Majority of the retailers concentrate on the colour scheme of their store targeting to showcase his products and capture the consumer’s attention. Colours are an effective and powerful tool and help create an association with a product which the customer remembers for a long time. An aesthetic colour scheme always has a pleasing effect, and a retailer must use the colour scheme creatively to enhance his store’s benefit. So all you retailers who are in the process of developing a new store design and brand consider colours as an important factor to grab consumer’s attention and give that touch of magic to your store.